If you're in the market for a new smartwatch, you currently have more choices than ever. If you're an iPhone user, Apple has you covered with the Apple Watch. If making mobile-payments at virtually any store with just your wrist sounds like something out of the future, Samsung's new Gear S3 has you covered. And that's not to mention the heap of Android Wear-powered watches currently on the market. Between the Moto 360 (2nd gen), Huawei Watch, CASIO Smart Outdoor Watch, Fossil Q Founder, and more, there's truly something for everyone. There have been recent reports that Huawei, LG, and Motorola would not be releasing any additional Android Wear watches for the rest of 2016, and this has created for a bit of concern surrounding the platform as a whole. However, that's not to say that Android Wear has completely run out of steam. Android Wear 2.0 looks like it'll bring some much-need features to the wearable platform, and other watchmakers continue to kick out Android Wear-powered gadgets. The most recent addition is that of the Nixon Mission that just went up for pre-order today, and if you're in the market for a new smartwatch, this is definitely one that should be on your shortlist. First and foremost, the Nixon Mission is an incredibly durable watch that's been made to withstand all of the elements imaginable. Nixon has crafted the Mission to support 10 ATM water resistance, shock resistance with its 48mm polycarbonate casing, and the 316L surgical grade raised bezel that's crafted out of stainless steel goes the extra mile to help with the screen's overall durability. 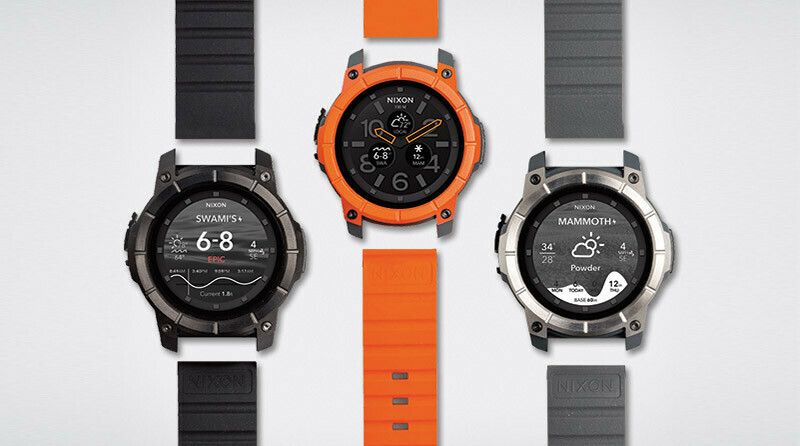 The watch also comes equipped with a built-in GPS, thermometer, altimeter, e-compass, barometer, accelerometer, gyrometer, and humidity sensors. The Mission is able to use all of these sensors to achieve a whole list of features, with one of the most notable being the fact that it can accurately read off information regarding both surf and snow shred alerts. However, perhaps one of the most surprising additions is the fact that Nixon has crafted their own version of Moto Maker to allow you to fully customize the Mission to your heart's content. Through Nixon's customization suite, you'll be able to customize the Mission's case, bezel, watch face, and watch band - with 24 total color options available for the watch band alone. 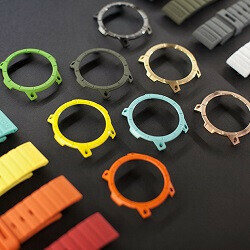 Nixon is even allowing customers to add a personalized bit of artwork or text on the underside of the case, further adding to the Mission's overall customization factor. If the Nixon Mission sounds like something you might be interested in, we need to warn you that it doesn't come cheap. The watch has a starting price tag of $400, but if you decide to personalize yours through the customization suite, that price will jump up to $450. However, that's still cheaper than CASIO's Smart Outdoor Watch that currently retails for $499.99. The Nixon Mission is currently up for pre-order through Nixon's official website, and the watch will leave the pre-order stage on October 10. If you're in the market for a rugged smartwatch that doesn't cut any corners when it comes to its feature set, Nixon's Mission is definitely worth your consideration. So 10 ATM is a depth of 100 meters. Plus all the other sensors. Also it has specific software for golfers, Skiing, and snowboarding, and more. Not to mention you guys forgot to mention that it's also using the new Qualcomm Snapdragon Wear 2100 processor. It also supports both iOS and Android. When you mention the mission is expensive at $400-$450. This is a stainless steel watch to start off with 316L steel. The same as the Apple watch. Only the stainless steel Apple watch has less features and functions, and costs almost double. It's one heck of a smartwatch, bruh. I'll consider it, when it hits the shelves. Nice... Your post has me wanting this watch more then the article did! The only thing I would change is adding a heart rate monitor. I'm a little surprised they couldn't do that. I'm not a huge watch fan, but i would probably buy that.